All sorts of innovative businesses are thriving in the Erie area. Here, we highlight a small sliver of the many locally owned and operated employers that make up our regional economic mosaic. Some have been around for decades, while others just recently broke ground. Two are among the top 50 employers in Erie County. Four were founded in the last decade. And each one is making a positive impact on our region. Let's take a closer look. LED lighting is unique in its directionality. Whereas incandescent and fluorescent light bulbs scatter their energy in all directions and inevitably burn out, LEDs (light-emitting diodes) put forth a more concentrated effort, often long outlasting their counterparts. It is an apt parallel for Green Lighting LED, a business that shines today because of a singular focus and the supporting structure to convert concept into execution. "Erie is a great environment for entrepreneurs," says Vice President of Sales Josh Gehly, whose father Joel founded the company in 2007, "essentially [out of] a closet." Gehly credits resources such as the Erie Technology Incubator at Gannon University for illuminating Green's path to success. Gehly credits resources such as the Erie Technology Incubator at Gannon University for illuminating Green's path to success. The ETI helps promising tech startups manage the heat in the critical early stages of business development, offering guidance, mentorship, and funding. A poorly-engineered LED degrades quickly because it does not regulate heat effectively; so too do fledgling companies who do not find a way to control their costs. The resources the Erie community provided helped dissipate that heat, allowing the Gehlys to operate more efficiently. Today, Green Lighting LED manufactures a full line of LED lights and fixtures, shipping to all parts of North America. Their small size has proven an asset, not a hindrance, as it affords them a greater degree of flexibility. Among their recent projects were two large custom orders for the U.S. Air Force, a subsidiary of their most loyal customer: the U.S. government. "We've definitely had to find our niches. We are pilot fish in a world of sharks in a big ocean. We have to focus on aspects the big boys leave behind," says Gehly. The pilot fish, a carnivore that coexists peacefully with sharks in the wild, feeds on the little details the larger predators forget about. 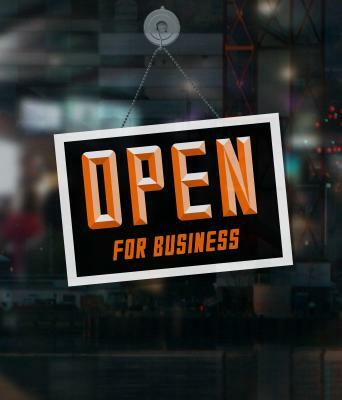 It's a great analogue for how small business can not only sustain itself, but also thrive. To call the American craft brewing industry a late-bloomer would be a tremendous understatement. Despite being at least 40 years old, it didn't hit its growth spurt until about a decade ago. Since 2006, the number of American microbreweries has climbed from 370 to 3,132 (a modest 846 percent increase) and the number of brewpubs has risen from 989 to 1,916 (194 percent), according to the American Brewers Association. In that time frame, the Brewerie (2006), Lavery's (2009), Erie Ale Works (2014), and Millcreek Brewing (2015) have begun operation. Predating them all, however, is Erie Brewing Company, established in 1993 as Hopper's Brewpub in Union Station. That first year, 1,040 barrels were enough to quench locals' curiosity. Today, the brewery produces 6,500 barrels annually and distributes in six states. Given this prolific growth, EBC's production facility (9,900 sq. ft.) no longer fits its business – imagine a high school senior trying to squeeze into the same clothes he or she wore as a freshman. It has become awkward and uncomfortable for the size of ownership's aspirations (the Lowther family acquired the company in 2012). A new 20,000 square foot building on the outskirts of the Penn State Behrend campus in Harborcreek will house the brewery, a brewpub, and a John's Wildwood Pizzeria. This summer, Erie Brewing Company is finally going to college. A new 20,000 square foot building in Knowledge Park on the outskirts of the Penn State Behrend campus in Harborcreek will house the brewery, a brewpub, and a John's Wildwood Pizzeria (a longtime favorite of Edinboro students). At last, EBC can stretch out, spread its wings, and maybe even get into a little experimentation. 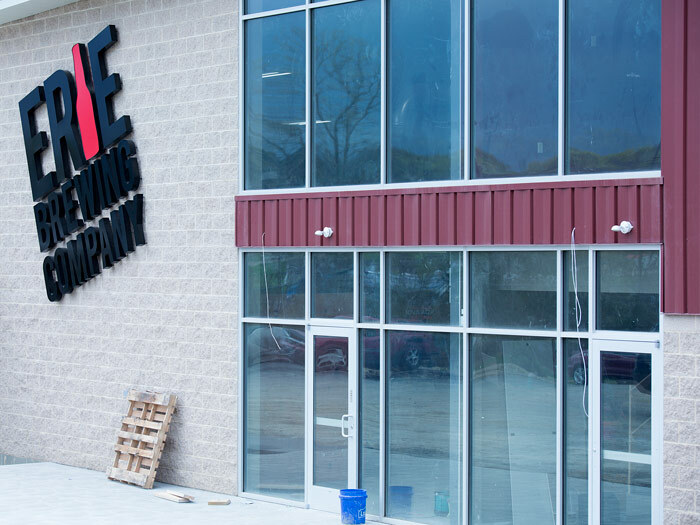 "We're a distribution-only company; we kind of had to focus on what sells, what [could] be sent out to the market, whereas now with the new facility, we can do a lot of crazy one-off things we couldn't do before," said brewmaster Shaun Carney in an interview with yourerie.com. While it may seem the craft brewing industry has come to a head, there remains plenty of untapped potential. Perhaps no company in North America is more smitten with the idea of a close shave than American Turned Products (with all apologies to Gillette), an industry leader in metalworking that strives tirelessly to keep its cutting-edge sharper than its competitors. They not only welcome the challenge of machining complex parts within extremely close (near unforgiving) tolerances, they have the industrial muscle to back it up – 95,000 square feet of manufacturing space between the Erie and Fairview facilities. "All of our equipment is designed to be flexible to allow us to serve diverse markets. We can supply parts for any number of different industries and be competitive." Within those facilities are some of the most sophisticated machines in the world, according to CEO Scott Eighmy, whose father Jerry founded the company in 1984. "All of our equipment is designed to be flexible to allow us to serve diverse markets. We can supply parts for any number of different industries and be competitive." Foremost among ATP's clientele is the automotive industry, but they serve the medical, electronics, and refrigeration industries as well. CNC (computer numerical control) machines – automated, programmable lathes – perform most of the duties at the shop, fashioning rotating hunks of metal into a variety of intricate shapes. ATP also employs the electrical discharge machining process for more delicate pieces (generating electrical currents to melt away bits of them) and centerless grinding (feeding pieces between two large wheels – one stationary and one moving) for high-volume production. ATP takes pride not only in its versatility, but also its precision. Its quality control practices are exhaustive to ensure the defects per million parts shipped hovers right around zero – in other words, the best man can get. When it comes to community, the Lake Erie College of Osteopathic Medicine favors a holistic approach. The LECOM juggernaut encompasses broad swaths of West Grandview Boulevard (main campus), Peach Street (Medical Associates of Erie, LECOM Senior Living, the John M. and Silvia Ferretti Medical Fitness & Wellness Center, Coffee Culture, etc. ), and the Bayfront area (the Presque Isle Rehabilitation and Nursing Center, Lifeworks, the school of graduate studies) – and that's just in Erie alone (Corry Memorial Hospital serves the rural areas of Erie County). Factor in its Greensburg, Pennsylvania (within Seton Hill University) and Bradenton, Florida campuses, along with 41 teaching hospitals/office sites situated in seven states (the Lake Erie Consortium for Osteopathic Medical Training), and it adds up to a whole lot of resources for its 4,000-plus enrollees and 9,000-plus alumni. LECOM was established in 1992 by Millcreek Community Hospital physicians and administrators, who saw the need to bring more healthcare practitioners aboard. LECOM was established in 1992 by Millcreek Community Hospital physicians and administrators, who saw the need to bring more healthcare practitioners aboard. That relationship has ridden a cresting wave ever since, with U.S. News & World Report declaring it a top 5 school for graduating primary care physicians. It is now the nation's largest (and second most affordable) medical college and the only academic health center (defined as the integration of health profession school, patient care operation, and research enterprise) in the osteopathic profession, which centers on promoting the body's innate ability to heal itself and how wholesale changes to lifestyle can prevent disease and lead to better health. As the inner workings of the body differ from individual to individual, so too does the machinery of each mind. LECOM allows each student to tailor the curriculum to how he or she best learns, with five pathways to attaining the osteopathic medicine doctorate. Among the most innovative of these is the Problem-Based Learning Pathway, in which medical case studies provide the foundation in the biochemical and clinical sciences. It's a sort of inside-out approach that offers real context from the onset, and is also the basis of LECOM's recently founded School of Dental Medicine (its last-year students serving community needs). Meanwhile, LECOM's School of Pharmacy is one of very few in the nation with online distance learning and accelerated degree options. That is not to mention the post-baccalaureate program (an extra year of preparation for aspiring med students at over 100 participating institutions, including Gannon, Mercyhurst, and Edinboro) and the numerous postgraduate degrees LECOM has introduced in recent years – including the MS in Biomedical Sciences (for researchers) and the PhD in Anatomy Education. LECOM is many parts working together to comprise one cohesive whole. At this moment, you're within arm's reach of something plastic. With varying nuances in shape and function, every bit of plastic has to be meticulously designed and produced. Since they've manufactured countless pieces for consumer use, chances are you've come in contact with something that The Plastek Group has made. Take deodorant for example: The company produces an estimated three million stick packages per day, every day of the year. They also play an important role in food and beverage goods, plus cosmetics and pharmaceutical packaging. For decades, The Plastek Group has stood at the forefront of this relatively under-appreciated market. Erie has long been a top center for plastics. For decades, The Plastek Group has stood at the forefront of this relatively under-appreciated market. Founded in 1956 as the Triangle Tool Company, Plastek is now one of the top 50 plastics injection molding companies in North America. They're also one of the top 20 largest employers in Erie County, providing more jobs than either Mercyhurst University or Wegmans. The business is headed by Chairman of the Board Joseph J. Prischak. From humble beginnings in the molding department of Erie Resistor, Prischak managed the formal launch of Plastek in 1971. Prischak helped to oversee Penn State Behrend's plastics engineering technology program, a four-year degree. In addition to his lifelong work at Plastek, Prischak founded the nonprofit Africa 6000, an organization that helps bring clean, safe water to places in need all over the African continent. In 1983, the company purchased Erie's Spectrum Molding and Engineering. Expansion continued throughout the decades, as new locations were launched for the Erie company. With five locations in Erie, including corporate headquarters, Plastek has grown to include facilities in Hamlet, North Carolina, Queretaro, Mexico, Indaiatuba, São Paulo, Brazil, and Mansfield in the United Kingdom. 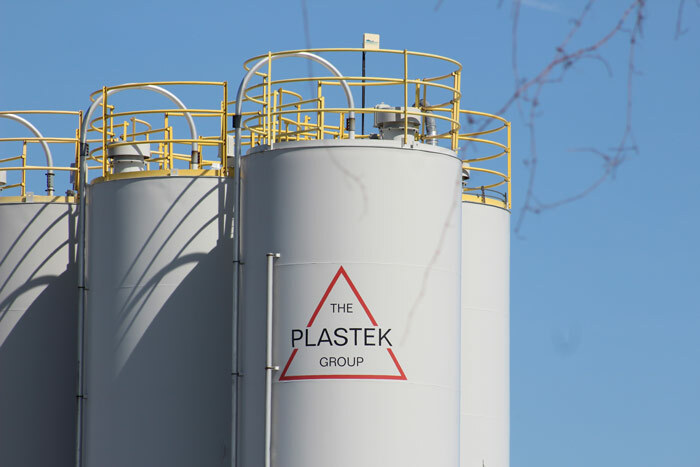 For over 60 years, The Plastek Group has been an integral part of the Erie community. With far-reaching production and innovative designs, the company sets a powerful example for business around the region and around the globe. Within a few short years, Jessica Yochim is movin' on up. Beginning in her parent's garage, she helped build MenajErie, a thriving video production company that now boasts a handful of full-time employees, and a brand new collaborative studio. After graduating from Penn State University in 2012, Yochim found herself at a crossroads. Moving back to her hometown of Erie, she wondered what would become of her recently acquired film degree. She detailed the early days, explaining, "Little by little, I started making personal connections and attending networking events so that people knew who I was and what I had to offer. I reached out to organizations that help businesses get started." They recently opened the doors to their Creator Studio, a rentable space featuring a 25-foot white cyclorama "infinity" wall, a full lighting setup, and an audio production space designed for podcasting and recording. With camera in hand, she began her business. A year later she was joined by Nick Taylor, a self-taught cinematographer with an accounting degree who is now Yochim's husband. The pairing was a success, eventually leading to the addition of Nick's sister, Leah Taylor, and most recently, her Edinboro schoolmate Greg Happ. "At first, I was hesitant to work with close friends or family," Yochim admitted, "but I soon realized that those are the people I can rely on the most." MenajErie moved from the garage, to the newlyweds' attic, then to Radius CoWork until they settled on a space a few floors above, in the Renaissance Centre. 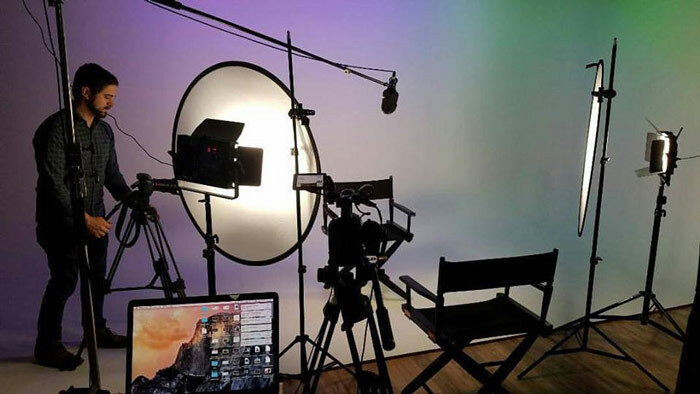 They recently opened the doors to their Creator Studio, a rentable space featuring a 25-foot white cyclorama "infinity" wall, a full lighting setup, and an audio production space designed for podcasting and recording. Making a name for themselves in the area thanks to their national-level commercial videography and photography, MenajErie offers plenty to hear and see. 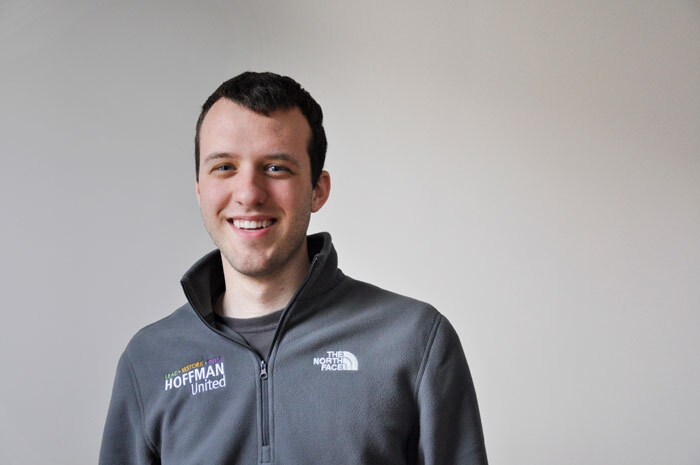 It's not often that you see a 19-year-old college freshman combating blight, but that's just what Cathedral Prep graduate Paul Hoffman is achieving with his company, Hoffman United. He's also turned over more than half a million dollars in revenue along the way. Witnessing thousands of abandoned houses and distressed residential properties, Hoffman formed a plan to reverse the wave of blight that threatens the city of Erie. Witnessing thousands of abandoned houses and distressed residential properties, Hoffman formed a plan to reverse the wave of blight that threatens the city of Erie. Armed with an interconnected combination of services, Hoffman United is poised for a workable solution to this problem. The company offers real estate development, construction, and property management, seeking to improve blighted properties throughout the city. Hoffman may be a young man, but he's a man on a mission, saying that "through every battle, every defeat, and every victory, my entrepreneurial vision has remained the same: to create a long-lasting legacy in the Erie community, the nation, and the world." He emphasizes, "We started with conviction instead of rational thinking because rational thinking said it was impossible, but nothing is impossible and anything can be built as long as you truly believe in yourself." Through their development branch, the business targets locations with issues. Neglected, damaged, or decaying properties are renovated, transforming them into livable, safe, and vibrant housing. Acquiring abandoned buildings and residential properties, Hoffman works with community leaders to secure these sites for renovation. Construction plays an important role in Hoffman's plan, as well. The company offers roofing, additions, remodels, painting, patios, retaining walls, and other full-service general contracting projects. Currently employing two construction crews, Hoffman United has the tools to fully rehabilitate the properties they acquire. After the properties are identified, secured, and renovated, the property management arm of the company takes over. With services ranging from leasing to maintenance, the company makes sure that these houses become homes. If you have any electronic gadgets collecting dust, you might want to check out MaxBack. While most businesses seek your money in exchange for their products, MaxBack is finding success with a different approach. Customers can make money by selling their slightly used phones, tablets, and wearables, and other high-end electronics. Through the buyback of in-demand items, users are able to earn hundreds of dollars by sending a single item in. President Sean Michaels clarifies it simply, illustrating that "MaxBack.com provides a convenient, hassle-free solution for individuals and businesses looking to sell used smartphones and other electronic devices." Describing the online experience, he elaborates that "sellers can visit MaxBack.com for an instant quote. The entire process from shipping the device until receiving payment typically takes under a week." Beginning as the side operation of a billion-dollar corporation, MaxBack is now an independent entity headquartered in Erie. Beginning as the side operation of a billion-dollar corporation, MaxBack is now an independent entity headquartered in Erie. In 1997, Michaels helped to found FundingFactory (then known as ETCEP), an innovative company that, in a similar style, paid participants for their used printer cartridges. The company championed recycling and elimination of e-waste, later expanding to Environmental Reclamation Services. The business was bought by the Chicago-based corporation, Clover Technologies. In 2010, Michaels, along with a team of Erie employees, began MaxBack. Michaels then engaged in a buyback of his own, purchasing the company himself in 2016. With his own visions for the business, Michaels intends to widen the scope of what the company accepts, and has plans to partner with local animal shelter Because You Care, with a fundraiser known as TechFurFunds. With a new Erie location, the company is forging an independent path, with renewed energy and a fresh road ahead.